Social media may seem overwhelming. You can’t be everywhere at once, so how can you choose the social media channels where your web presence will have the most impact? It’s a question a lot of businesses struggle with, and it’s especially daunting for B2B. Who is your customer? Your first step is to flesh out an accurate customer persona. Is your buyer male? Female? How old? Do they have a college degree? What are their likes and dislikes? What do they read? What do they want or need? Your Assignment: Once you fill in the basic demographics, take a look at this Pew Research Center report. Match your buyer demographics to the social media market where they have the most presence. Next, check out your biggest competitors. They’ll have the same potential customer base, so it makes sense to find out who is engaging with your competition and on what channels. Your Assignment: Running a competitor analysis can give you a clear picture of where your competitors are seeing success and what content their audience (and yours) most responds to. Yes, there are a lot of social media options these days. Here’s the basics about the biggest social media platforms and what to expect. Google+: Social media studies often overlook Google+, even though it’s a channel growing in both functionality and popularity. Google’s search algorithm favors Google products (surprise, surprise), so that means Google+ is a great social media option for many businesses. Google+ also offers additional SEO value. You can optimize your posts with keywords and hashtags, and each email you send to a Gmail user will include a button to follow your page. LinkedIn: LinkedIn is populated with business folk, so it’s typically a great platform for B2B communications. Keep your posts professional and to the point. Add links that drive traffic back to your website. Keep your private messaging personal and never spammy. 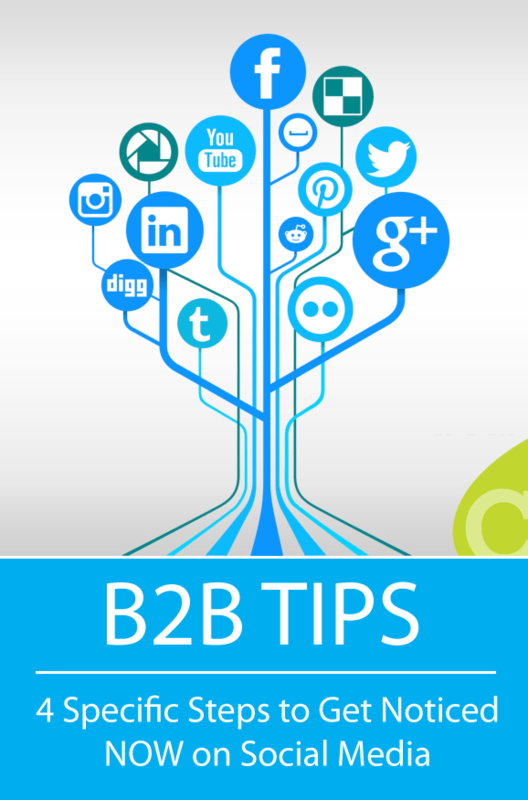 More than 80% of B2B social media leads originate on LinkedIn, so make your content count. Twitter: Engage your audience and make new contacts on Twitter. Twitter is a great place to connect with industry leaders, influential bloggers, brand advocates, and publishing platforms who will help you spread your message. Regular, active participation in industry hashtag chats is a valuable way to develop relationships with the right people. Facebook: The big daddy of the social media sphere, Facebook offers an ability to hold lengthy conversations with customers and ask for input. However, sometimes it’s not the best place for B2B, so do your homework before committing. Pinterest and Instagram: If you can create great visual content, consider Pinterest or Instagram. Users are engaged and love to share—just be sure you’re connecting with the right people by narrowing down your target audience. For a more in-depth explanation of each of these social media platforms and more, check out our post: Which Social Media Platform Is Right for YOUR Business? Content comes in all forms: video, graphics and photos, tweets, longer blog posts, surveys, and links. No matter what social medium you choose, longer posts and rich content that includes graphics and videos is most widely shared and will help you sell your brand. Share photos of your products, your business in action, your staff, and your customers, if possible. Involve your customers by asking them to share photos of how they use your products. Ask them for input directly or post fun quizzes. The information you’ve gathered thus far gives you the basis for your social media plan. When you know who your customers are, where they hang out, what kind of content they engage with, and what social media channels are most advantageous—then you’re ready to get rollin’. A word to the wise: One way to manage several social media channels is with automated posts, but be wary of automating too much. While some programs seem chatty and human, recipients almost always know they’re being addressed by a bot and not a person. You’ll also want to be careful about cross-posting. Longer posts crafted for Facebook will be truncated when posted to Twitter. If you need help crafting a complete social media strategy, contact Cultivate Communications or download the free resource below. Never forget that social media is social…the whole point is to build relationships and keep your customers interested and in the loop. When you build audience, you keep your sales pipeline full. Want to know more? 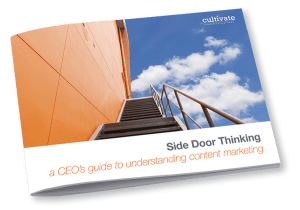 Download this free guide to content marketing, Side Door Thinking.